Every morning we wake up and set the wheels in motion for another swirling day of hectic, hectic, hectic. Work, play, angst, bliss; brain in overdrive; emotions riding shotgun among wild dreams and data, passion and common sense. Living in an amazing Internet of Things mindset, what we used to call the “nature of things” now has very little to do with ‘nature’ and an increased focus on ‘things’. Montréal Space for Life puts it all back in balance – inviting us to reconnect with nature’s balm in a tropical haven, where winter is banished and butterflies go free. For its 20th anniversary, Butterflies Go Free is hosting a beautiful, colourful celebration of all the ways nature benefits us. Inspired by this year’s theme of Here’s to Life!, Montréal Space for Life invites everyone to experience nature in the company of fabulous butterflies, flitting about in lush greenery and welcome warmth at the Botanical Garden’s Main Exhibition Greenhouse. This magnificent, immersive adventure, created by the Insectarium team, runs from February 23 to April 30, and is designed to raise awareness of biophilia and its importance in our lives. By definition, biophilia is the basic relationship between humanity and nature: affection, attraction, aversion, dominion, exploitation, reason, spirituality and symbolism. These relationships are established in childhood and have a significant impact on the physical, mental and cognitive health of every human being. Since 1998, more than 2.2 million visitors to Space for Life have experienced nature’s wonders, up close and personal. Scientists have proven that, over time, this innate connection generates significant health benefits and creates a deep-seated desire to protect biodiversity. Just imagine the relaxing effect of being surrounded by a thousand butterflies, gently floating from flower to flower, sometimes brushing by you, in a vast tropical landscape where temperatures range between 75 and 84°F. Along the pathway, Insectarium’s nature interpreters are pleased to answer questions, and stir curiosity. Before leaving, visitors are invited to personalize their Butterflies Go Free experience by penning a brief note describing an extra-special moment they have spent in nature. Montréal Space for Life is made up of four attractions on the same site: the Biodôme, Botanical Garden, Insectarium and Rio Tinto Alcan Planetarium. These four prestigious municipal institutions form Canada’s largest natural science museum complex. Together, they are launching a daring, creative urban movement, urging everyone to rethink the connection between humankind and nature, and cultivate a new way of living. So, all you executives, entrepreneurs, and just plain busy people out there… did you hear it? The business of life balance is calling. 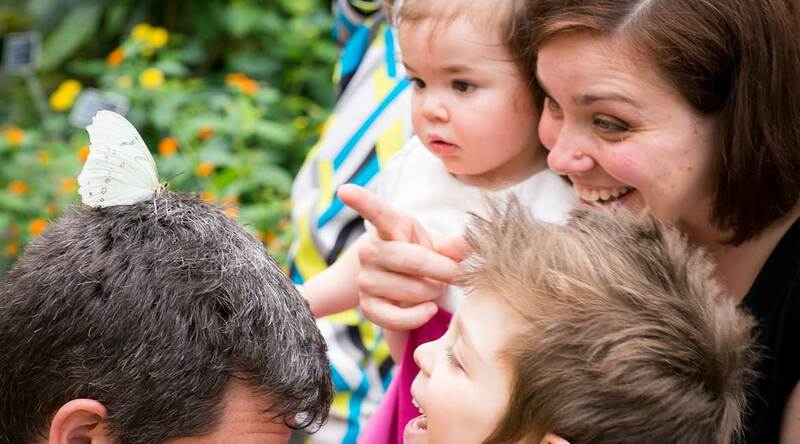 Bring your family, bring your team, or go it alone – whatever your pleasure, Butterflies Go Free offers a fantastic opportunity to nurture your natural side. Already planning? Good for you. HOURS: Tues to Sun, 9 a.m. to 5 p.m.
Each day, 1,500 to 2,000 butterflies and moths flit about freely in the Main Exhibition Greenhouse; about 100 are released daily. A grand total of 15,000 to 20,000 butterflies and moths are released during the event. During your visit, expect to see about 50 different species of the 75 that are active during the entire event. Lack of contact with the natural world can lead to “Nature deficit disorder,” with symptoms ranging from anxiety to depression, attention deficit, chronic fatigue, obesity, lower productivity, etc. (1) Reconnecting with nature can greatly alleviate these symptoms. LOUV, Richard. 2008. Last Child in the Woods. Saving our Children from Nature-Deficit Disorder. Workman Publishing Company. 390 p.
KELLERT, Stephen R. 2013. Birthright. People and Nature in the Modern World. Yale University Press. 242 p.